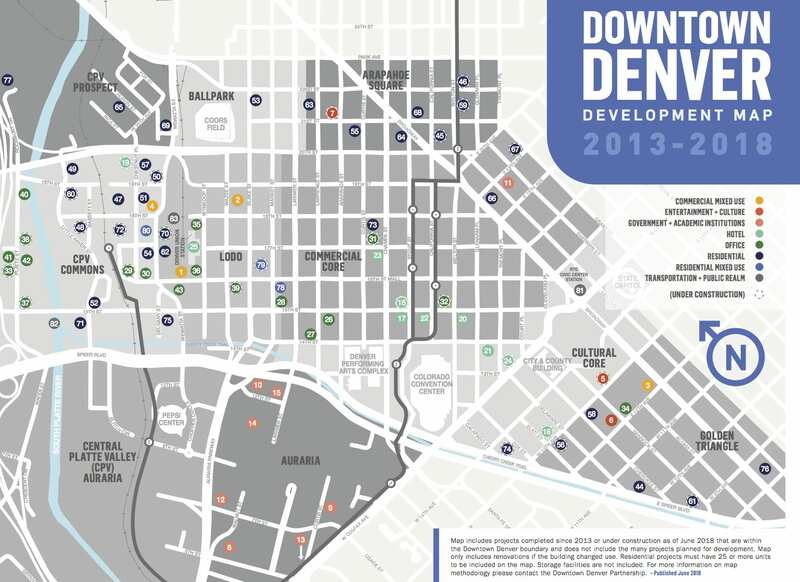 More than $5 billion in commercial real estate projects have been completed over the last five years or are under construction in downtown Denver, the Downtown Denver Partnership announced in releasing its annual Downtown Denver Development Map Tuesday morning. The investment consists of nearly 10,000 new residential units, more than 4 million square feet of office space and 3,200 hotel rooms. Of the 83 projects, 26 currently are under construction. The development map’s release was part of the DDP’s annual Development Forum, where attendees had a chance to interact with developers of major current and upcoming mixed-use projects, including the Colorado Rockies’ West Lot; The World Trade Center in River North; The River Mile, a 62-acre future development of the Elitch Gardens property; North Wynkoop; Market Station; and Platte Fifteen. Leaders of Denver’s largest brokerage firms also shared insights on the office, retail, hotel and multifamily markets, as well as how Denver stacks up against peer cities such as Nashville, Tennessee; Austin, Texas; and Salt Lake City.